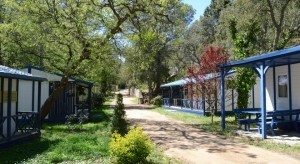 Local Camp Sites Holiday Bungalows on The Costa Brava. Local Camp Sites Holiday Bungalows. Here you will find some of the best places to camp in the Mediterranean area of Europe. All bungalows have a furnished porch and feature wooden floors and a private bathroom. There is a living room with a sofa bed, and a well-equipped kitchenette with a fridge and coffee maker. The Turismar Village complex has a mini-market with drinks and other basic products. There is also a snack bar/restaurant and a barbecue area with free access. Guests can play table tennis and billiards in the games room. Children have their own playground. WiFi is available in the restaurant, bar and furnished terrace, for an extra charge. 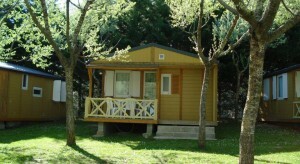 from spain-info Costa Brava Holiday Camp Bungalows. Free parking is available, and Rupit Park is just 27 km from Olot and La Garrotxa Volcanic Nature Reserve. Many beaches on the Costa Brava can be reached in 1.5 hours by car. Latest booking: 3 day’s ago. All Conca de Ter Bungalows are equipped with heating, as well as a kitchenette with a fridge. They also have a seating area with a sofa and TV. The camp site has sports facilities such as a volleyball court and a basketball court. It also offers a games room with table tennis and pool tables, and staff organise a varied entertainment programme for children. Conca de Ter’s restaurant serves a mixture of French and Mallorcan food. There is also a bar where you can have a drink. Vallter 2000 Ski Resort is a 30-minute drive away from the camp site. 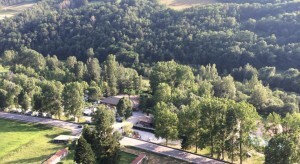 Camprodon Golf Club can be reached in 15 minutes by car. Some of the best places to camp in Mediterranean Europe are to be found in the camp sites and in the Holiday Camp Bungalows of the Costa Brava. The Catalan Pyrenees landscape features make it possible to practice a wide range of sports: the combination of sea and mountains, valleys and mountains, sun and snow helps you to find a beautiful landscape to ride in. We wait for you!! !